This Article addresses an immensely important, and often neglected, problem faced by legal practitioners in their daily professional lives: how do legal actors feel, and act, when the cases in which they are involved have evident, and disturbing, socio-economic implications? This situation is particularly uncomfortable for prosecutors, judges, and defense attorneys, whose criminal case workload often reflects much deeper social inequalities and problems, and whose defendant population is characterized by an overrepresentation of disempowered groups. Legal actors who engage daily with "the tip of the social iceberg" in the courtroom are keenly aware of the broader aspects of the problem; this awareness not only complicates their intellectual perceptions of their work, but also their professional satisfaction and morale. 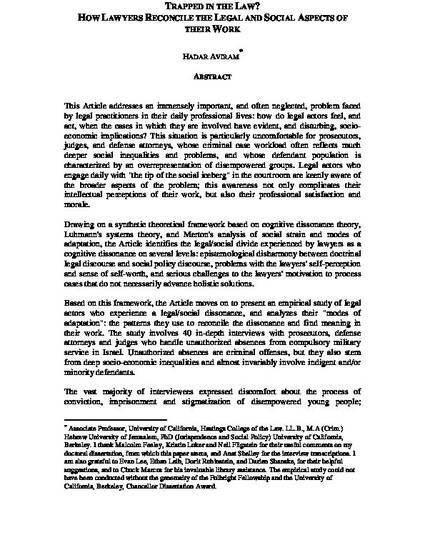 Drawing on a synthetic theoretical framework based on cognitive dissonance theory, Luhmann's systems theory, and Merton's analysis of social strain and modes of adaptation, the Article identifies the legal/social divide experienced by lawyers as a cognitive dissonance on several levels: epistemological disharmony between doctrinal legal discourse and social policy discourse, problems with the lawyers' self-perception and sense of self-worth, and serious challenges to the lawyers' motivation to process cases that do not necessarily advance holistic solutions. Based on this framework, the Article moves on to present an empirical study of legal actors who experience a legal/social dissonance, and analyzes their "modes of adaptation": the patterns they use to reconcile the dissonance and find meaning in their work. The study involves 40 in-depth interviews with prosecutors, defense attorneys and judges who handle unauthorized absences from compulsory military service in Israel. Unauthorized absences are criminal offenses, but they also stem from deep socio-economic inequalities and almost invariably involve indigent and/or minority defendants. The vast majority of interviewees expressed discomfort about the process of conviction, imprisonment and stigmatization of disempowered young people; however, participating in the process was part of their daily work. The interviews reveal five ways in which the lawyers coped with the dissonance between their beliefs about the problem and the need to do their work: loyalism (ignoring or downplaying the social aspect of the problem); bureaucracy (disengaging from deeper meanings and focusing on case processing); disgruntlement (venting anger and frustration about the futility of the legal solution to the problem); cynicism (expressing despair and pessimism about the solution), and divergence (finding ways to redefine their role and perform extra-legal roles). The sixth way, which was almost universally mentioned by interviewees, is a "classification" of the offender population into "bad" (manipulative) absentees, whose absences are a product of calculated free choice, and "good" (impulsive and miserable) absentees, who leave the army out of necessity and distress. The analysis of the study's findings compares these "modes of adaptation" to Merton's categories, examines some differences in adaptation across legal role and seniority, and comments on the degree to which the actors feel bound by legal perspectives.  The conclusions offer some theoretical implications of the study's findings, and also make some policy suggestions about relaxing the boundaries between legal and social discourses in legal practice.